The workers went back to work after the management assured them of no victimisation, says union, which is meeting on December 10 to chart future course of action. 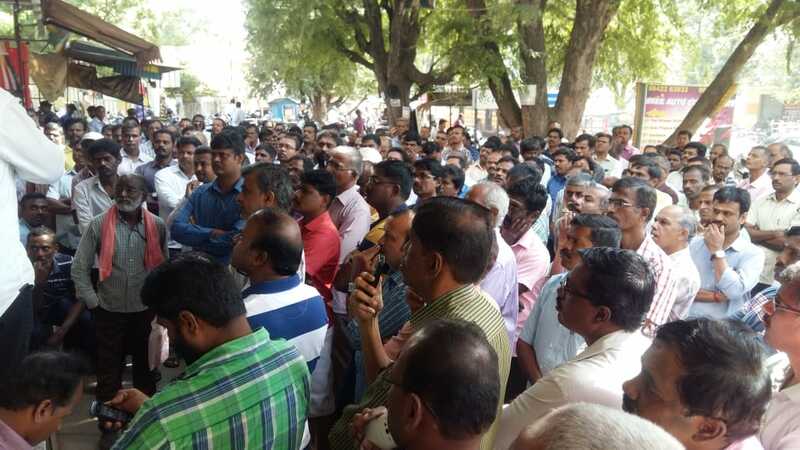 CHENNAI: After 100 days of struggle, about 300 permanent workers from Pricol, the automotive components manufacturer based in Coimbatore, Tamil Nadu, ended their strike on Tuesday after the management agreed to some of their demands., as instructed by the State Labour Department. But their victory was short-lived as after joining back, over 300 of them were handed transfer orders. The workers, who are part of the union -- Kovai Manila Pricol Thozhilalargal Otrumai Sangam (KMPTOS)-- affiliated to All India Central Council of Trade Union (AICCTU), had been protesting more than 100 days against the repressive policies of management. After an agreement with the management, when the workers went back to work, some 302 workers, who were active in the protest, received transfer orders to Andhra Pradesh, Uttarakhand and Maharashtra. The explanation given by the management was that the strike had caused a ‘severe’ loss to the company so they were being transferred, as the company wanted to save their jobs. The workers have been given three weeks to relocate to these other states. Incidentally, the strike was called off after the management agreed to follow up on the Labour Department’s instructions, such as settling dues of profit sharing and bonus for the protesting workers, giving pending allowances to the protesting workers, and assuring that there would be no victimisation. It was only after these assurances that the Labour Department asked the workers to rejoin the company at the earliest. But, the management seems to have back on its word, while the workers kept theirs and rejoined work, not knowing that a rude shock awaited them. This is not the first time Pricol employees are facing punitive measures from the management. Since 2007, the workers have been trying to raise their concerns regarding job security, collective bargaining and recognition of their democratic rights. The continued struggles led to the recognition of their union in 2011. The company witnessed many struggles since then and in 2012 and 2013 the management came to terms with the demands of the workers. But then it cracked down on the workers, which led to the arrest of 27 people, who were booked for conspiracy and murder. While 25 of them, including women, have been acquitted by the court, two union office bearers are still in jail. The struggle took another turn in April 2017, when Pricol workers conducted a one-day strike to express their solidarity with farmers in distress across the country. Farmer suicides were rampant at that time and Tamil Nadu also bore the brunt of it. According to a settlement in 2012, the workers can take a day off for their personal need and make it up with an alternative day of work. But the management warned the workers against a strike and took punitive measures. The workers lost eight days’ salary for a single-day strike! Apart from this, workers who were active in the union started facing a financial backlash as well. The company started discriminating protesting workers from others by paying them less bonus and allowances, said some workers. On an average, get a salary Rs 21,000 -23,000. The average difference between the bonus and profit share the company was giving to protesting workers and non-protesting ones was around Rs 40,000. At one point of time, two union office-bearers were suspended for 10 days, because a union flag was hoisted outside the factory premises. It was in this context that the union pushed for a new settlement in July 2018. But the management ignored their demands. On August 13, the workers conducted a warning strike, following which the management partially locked out 144. This led to the 100-day strike that began on August 21. From 2014 to now, times have changed for sure.